Avengers: Infinity War is going to be big, we knew that already. What Anthony Mackie – Falcon to you and me – has just revealed, however, has put the movie’s final act far beyond the reaches of anything else we’ve ever seen in MCU (or, frankly, movie) history. No spoilers here, don’t worry. Unless you want to go in completely blind, you’re safe. “I got 25 pages, which was the final fight sequence,” Mackie reveals during an interview on Good Morning America. Thankfully, Marvel put Mackie (and our own!) fears to rest by saying that only makes up the movie’s final battle. Were we to say one page (roughly) equals a minute of screen-time, we’re looking at, give or take a few cut moments and rewrites, a 25-minute battle sequence. 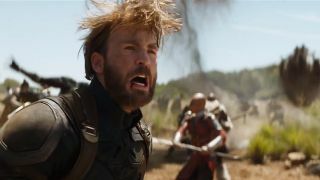 For comparison, Captain America: Civil War’s airport battle is only 11 minutes long, meaning we’re looking at what could be the longest fight in MCU history. Wowsers. It’s a fair shout that the final battle will take place in Wakanda (you know, the one with all of the Avengers running in slow-mo in the peculiar way that superheroes only run when they’re saving the world? That one), but, with Mackie only being given that part of the script, it’s a distinct possibility that he only shows up right at the very end of the movie to thwart Thanos, serving as a neat way to cram in roughly a billion characters into place. Even so, he’s going to be part of MCU history, as things go crash, bang and wallop on a scale hitherto unseen. That final battle might just kick off a new chapter of the MCU with all the bells, whistles and, yep, new Marvel movies that you can handle.